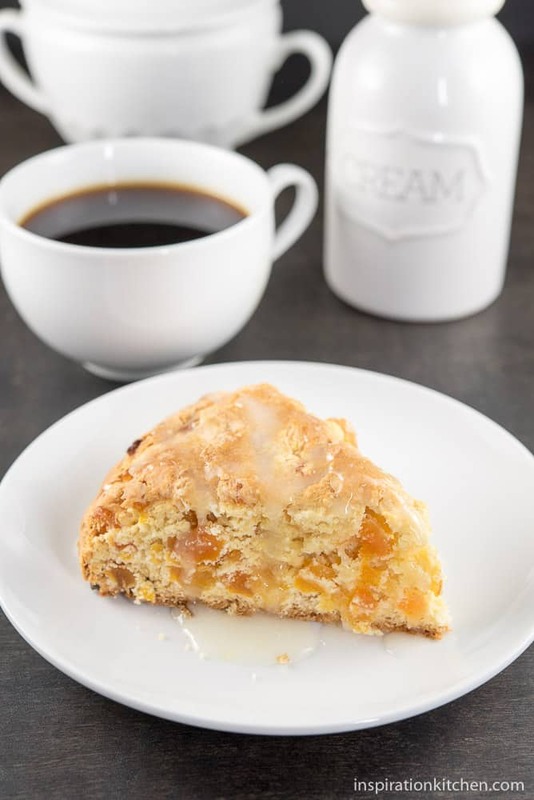 These Apricot Scones are super moist, with a pop of apricot in every bite and drizzled with a sweet sugar glaze that will make your mouth water. What is the first thing that you think of, when you think of breakfast? For me, the default answer is almost always scones. I just love the moist, crumbly, fruity, sweet flavor they bring to the table, and I can hardly wait to pop them in my mouth, to enjoy with my hot brewed morning coffee. 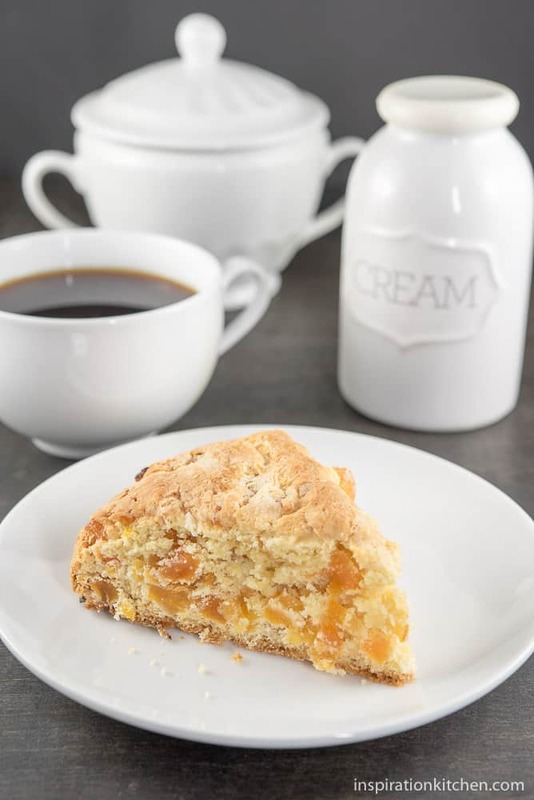 For me, there is something oddly comforting about scoring a scone in the a.m. You? On the carb front, I’ve never been a pancake eater, but throw me some breakfast carbs in the form of a scone, and you can count on me munching my way through the entire thing, while reaching for more. And with a sweet sugar glaze? Yes, please! What you’ll really love about making this recipe is, it is SO easy! And the concept of shaping the scone dough into a round shape and then gently scoring it with a knife to create the wedges made it super easy to cut once it was finished baking. No more fuss or mess – they come apart into wedges easily! 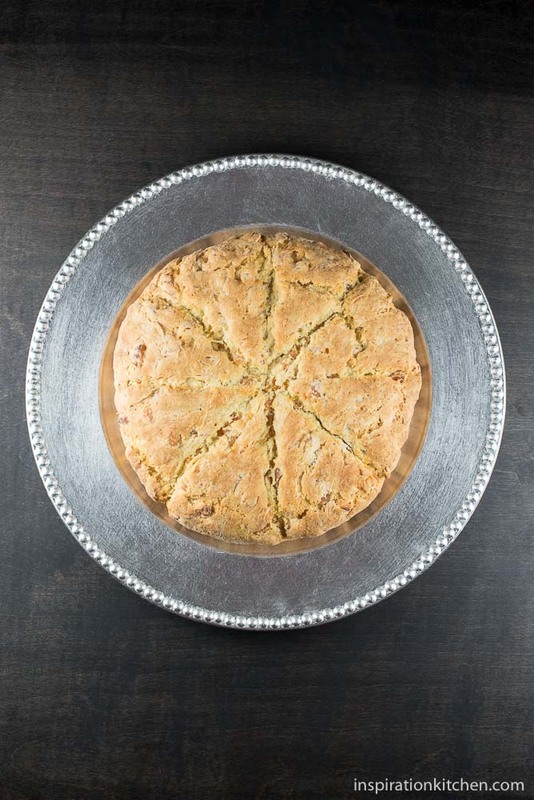 This process made it ssssoooo much easier than other scone recipes I’ve tried. This would be a great recipe to make with your kids. It’s easy, fun, and tastes amazing. And, if you make a double-batch, you’ll be more apt to share them with a friend! Combine flour, apricots, sugar, baking powder, baking soda and salt in bowl. Cut in ¼ cup cold butter with pastry blender or fork until mixture resembles coarse crumbs. Combine sour cream, egg, orange juice and 1 teaspoon almond flavoring in another bowl. Stir into flour mixture 1 minute or just until moistened. Turn dough onto lightly floured surface; knead 5 to 8 times until smooth. Pat dough to 7-inch circle on greased baking sheet. Score into 6 wedges; do not separate. Bake 18-25 minutes or until lightly browned. Cool 10 minutes. Combine powdered sugar, 1 teaspoon butter, ⅛ teaspoon almond flavoring and enough milk for desired glazing consistency in bowl. Drizzle over warm scones. Recipe modified from Apricot Orange Scones. The secret to making scones that are moist and not hard as rocks is keeping the butter cold. You can’t knead the dough 5-8 times without the butter melting somewhat. I pop my dough into the freezer for a minute to make sure it is cold. I remember as a child my grandmother putting her scones dough into the ice box and she never made a hard scone in her life. I will try putting it in the freezer next time. These scones were really moist and delicious though, just as written!